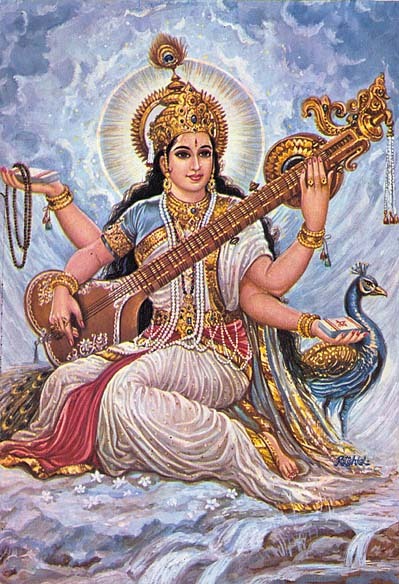 Saraswati, Hindu goddess of knowledge, music, arts (including writing) and science. Click! Yes, I’m published. Click! Published again. Click, Click. Click. I’ve never really been concerned that my readership is low, I truly write for myself (but that doesn’t mean I don’t check my statistics page like a hawk and get all excited when someone comments). I love the tippity-tap of my thoughts manifesting on screen, the words a reflection of my inner knowledge that many times I did not know I knew. I didn’t blog much while I was in grad school and even less now that I am back in the “real” world learning to make a living doing what I love. But it has become very clear to me that part of what I love IS blogging. And I have so many things I want to share from my graduate research and memoir-writing. * So many things from that experience that I still need to process. So many words I have still inside me. It is as a storyteller-writer-scholar, I want to introduce a new blogging project. Through it I will look at women’s studies, myth, psychology, spirituality, embodiment, goddess-consciousness, creativity, and of course, transformational/expressive writing. And I am giving myself self-inflcited -imposed deadlines. If I am to do what I love successfully, I must have deadlines. As my friend, author Burnham Holmes said yesterday in his presentation at the Horace Greeley Writers’ Symposium: Deadlines are your friends. The W.O.R.D.S. Project (Words Open Resonating Depths of the Sacred): A weekly alphabetical search for questions. Including writing prompts. Starting next week. I realized with discomfort that my last Authentic Voice Project post was in itself Inauthentic. I chose a safe word to explore. I shied away from tackling a true “trigger” word. I again silenced my voice out of fear of rocking the boat. I realized the hypocrisy of this and now I must fix it by writing about a “C” word is controversial (in some circles). But isn’t that what creates change? Controversy is just another word for “fear of change.” In this case it is me who needs change – transformation – towards self-acceptance and healing. It is the language that was etched into my cells and has caused me to deny my own potential, and it is, therefore, this internal language that must change. Authentic Voice knows my own truth. Society (i.e. Tradition) says (with slight alternations according to particular doctrines): Christ is the son of God who was born here on earth as Jesus of Nazareth, preached to the people of the Kingdom of Heaven, was crucified, rose to life and ascended to heaven. He died for our sins and is the mediator between humans and God and through whom we might one day also be with God. To be “Christ-like” is to symbolically “wake up Christ within” in order to engage ‘the deeper levels of the soul… to live our individual lives as fully, as authentically, and as obediently [i.e. true to our True Self] as Jesus lived his.” His death and resurrection are symbols of our repeated struggles to discover our unique potential by “crucifying” the myths we have been told and have told ourselves about ourselves (the “sin” of not recognizing our potential and/or purpose), and to arise anew. With each self-discovery we “ascend” towards our own divinity – i.e. be with God/Godde/Goddess/Spirit now and in every moment. Prompt: What other religious/spiritual myths or symbols speak to you and your psychological growth towards Wholeness? You know that feeling when a connection suddenly clicks in your mind? It is enlightening, almost joyful. I have even experienced it to be mind-boggling. Connections can be and are made all the time, connections that weave our world and those in it together. Connections – like the strands of a spider’s web – bond together for strength and bring us sustenance. When a new connection is made it is like a door opens: To understanding. To healing. About a year ago I had coffee with a successful author (Pulitzer/Emmy kind of successful) at a local cafe. He is a lovely grandfatherly man; he made me laugh and feel confident about my little aspiring-writer-self. I was just starting graduate school and he was interested in hearing about my studies. I told him about my fundamentalist religious upbringing and how I planned to write a memoir. As I explained to him my hopes for Transformative Language Arts to release me from the grip of the negative self-beliefs that religious dogma and tunnel-vision has the potential to instill, Mr. Pultizer quipped, “The Word.” I laughed at his pun but immediately understood he had just said something very significant. Yes, how ironic that I would be using words to release myself from The Word! But the deeper meaning I couldn’t quite place. It nagged at me. I pondered it, I mind-mapped it, I played with more word association, but still I couldn’t quite make the connection I felt was hidden there. One year later, I am lying in bed after waking from a particularly symbolic dream, trying to wrap my head around all its meanings. Suddenly, the connection between “The Word” and my writing of words clicked into place. I don’t know if the answer lay in the dream – which on the surface appeared completely unrelated – or if my dreamy state of mind had allowed meanings from deeper depths to float up. Either way, the connection was made. And It has to do with Authority (Author-ity). And Knowing. And Voice. And Balance of inner and outer, left and right, rules and compassion, body and mind… everything my thesis studies have been focused on but which I hadn’t quite pieced together coherently. And so, while my intuition knew that my author friend’s off-the-cuff pun was important, it took a whole year to percolate into something of substance. Our unconscious knows more than we know we know, but give it time and the pieces will eventually develop into a whole picture. One man, one conversation, one word – The Word – and a new door opened (albeit very slowly!) to connection, to new understanding. In my Yoga ‘n’ Write class this week I talked of the need for balance between our physical, mental, emotional, and spiritual bodies. We wrote about where we were at this moment in each of these areas and where we want to be. * Our yoga teacher told us about the Sheaths: Physical Body, Mental Body, Energy Body, Intelligence Body, and Soul. She said that Yogacharya Iyengar teaches that it is the Breath (prana) that integrates (balances) them all. We talked about paying attention to the breath and especially that moment just in between inhalation and exhalation. A month ago I co-presented a De-Stress workshop where my partner emphasized the importance of breathing as a way to calm. She talked about the “sweet spot” just before you exhale. Acknowledging this moment helps us stop and pay attention to the moment – to the vitality and wisdom of NOW. 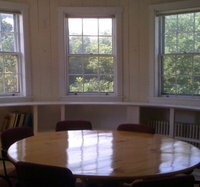 In our womb room at Goddard College we sang together… “Breathe In, Breathe Out…Breathe In, Breathe Out…” A circle room, a circle of Wise Women (self-named The Goddesses or Goddardesses), singing a circular song, and the breath circulated our bodies and connected us all. Breath connecting it all. Everything connecting. * Also visit here for another post on writing and making goals with the Four Bodies. Sources: (1) http://www.suite101.com/content/lilith-the-original-woman-created-a79725 (2) Chevalier, Jean & Alain Gheerbrant. Dictionary of Symbols. Penguin, 1994.